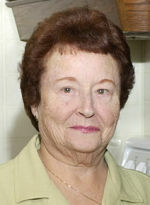 Sondra A.Shook of Otsego, passed away Saturday, May 26, 2012 at her home. Sondra was born September 3, 1938 in Otsego the daughter of Neil and Virginia (Bushee) Misner. She was a natural born homemaker and cook and enjoyed making holiday meals for her family. Sondra loved children and would often volunteer to babysit. When her son was playing hockey she was one of the original “hockey moms”. She was an avid Tiger fan and enjoyed trips to Las Vegas and going to dinner with family and friends. She especially loved her grandchildren and spending quality time with K.C. On September 10, 1960 in Otsego she married Gary Shook. Surviving are her husband, Gary; her children, Edwin Shook of Otsego and Elizabeth (Brent) Veldheer of Coopersville; 2 grandchildren, Ashlee and Kodi; her mother, Virginia Misner of Allegan; her siblings, Howard (Melissa) Misner of Leonard, MI and Jim (Kathy) Misner of Otsego; her father-in-law, Ed Shook of Otsego; several nieces and nephews. She was preceded in death by her father and her mother-in-law, Rosemary Shook. Friends may meet with her family from 6-8 P.M. Tuesday at the Winkel Funeral Home, Otsego where services will be held Wednesday at 11:00 A.M., with Mr. Ted Ransbottom officiating. Burial will take place at Mountain Home Cemetery, Otsego. Memorial contributions may be made to Wings of Hope Hospice or the ASPCA .